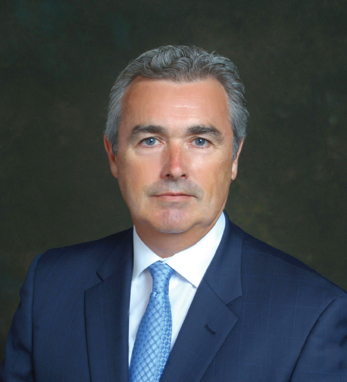 Dan Murphy, managing director, Scotia Capital USA, has a Wall Street career spanning over 29 years. He is a member of Scotia Capital USA’s board of directors and is responsible for strategy and business execution for the Global Equity business. Prior to joining Scotia Capital, he was the chief operating officer at Wachovia Global Securities Lending. From 1985 to 1999, Dan worked for the Merrill Lynch group of companies and held various senior management positions. Dan earned his Bachelor of Science degree in finance from Manhattan College and his MBA from Pace University. A second-generation Irishman, Dan lives in Ridgewood, New Jersey with his wife, Deirdre, and their three children, Ryan, Kellyann and Mackenzie. On his Irish heritage, Dan says: “It forms the foundation of much of who I am. It binds me to a history and people with a deep devotion to family, God and country.” Both he and Deirdre are active supporters of Table to Table, a community based organization dedicated to connecting excess food supplies with people in need. Dan and his family are also involved with the Crohn’s and Colitis Foundation of America.